Interpreting for WFD President? Wow! 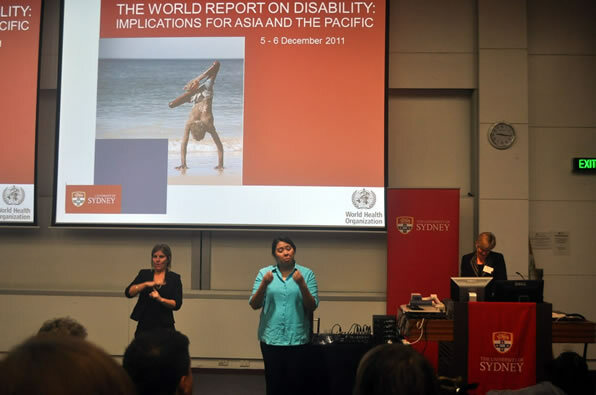 I attended the UN World Report on Disability Symposium hosted by the University of Sydney from December 2-8, 2011. Actually I wasn’t there to participate, but rather to interpret for the two very devoted and hardworking deaf ladies I ever knew, Maffy Gaya and Weng Rivera. They are the officials of Filipino Deaf Women’s Health and Crisis Center. We were all sponsored by Australian Aid (AusAid) including interpreting service fee courtesy of Ms. Badette Cariaga. The two-day event would be very tiring for me as a lone interpreter so I was accompanied by the Dean Nicky Perez of DLS-College of St. Benilde School for Deaf Education and Applied Studies. Ms. Badette told us that somebody commented about why the dean of a college and a director of another college would accept a position of just an “interpreter”. But we just shrugged off the issue. For us, interpreting is an exciting yet rewarding work. Besides, we don’t want to pass an opportunity in going to Australia for free! Actually we were only tasked to interpret for Maffy and Weng. Newly elected World Federation of the Deaf President Colin Allen was invited to attend since it was held in his country. 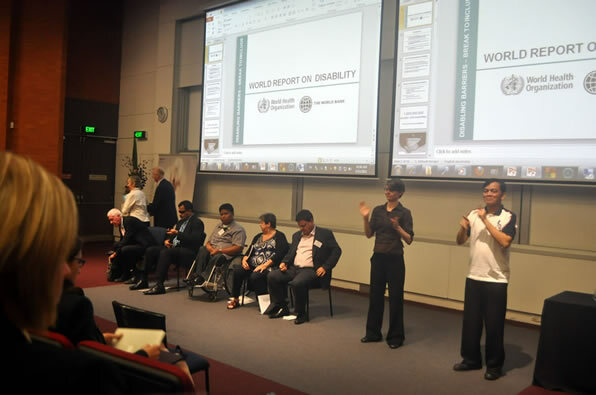 He also brought with him two interpreters from Australian Sign Language Interpreters Association (ASLIA). 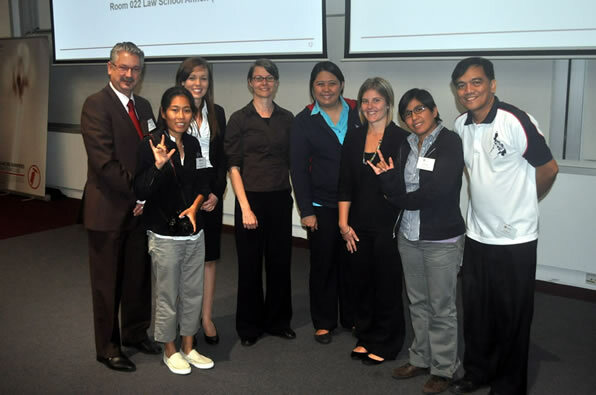 Nicky and I was referred to AusAid by ASLIA’s Philippine counterpart, the newly formed Philippine National Association of Sign Language Interpreters (PNASLI). But since the two of us are signing alternately, we were sort of like, also interpreting for Colin. 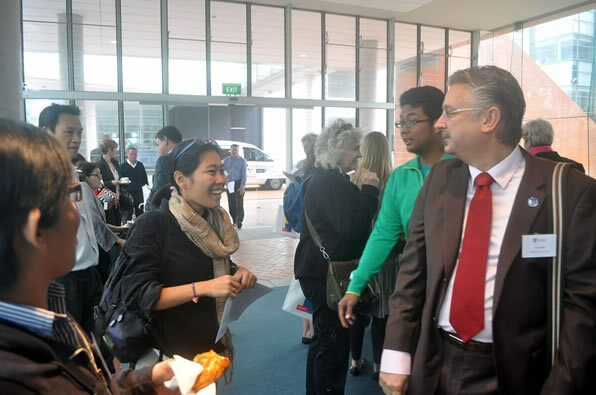 At first, Dean Nicky and I were having butterflies in our stomachs because of two things; one was interpreting in front of an international symposium for the first time, and the other was interpreting for the President of the WFD! Pressures, pressures! What if our signs were not clear? What if we experience a sudden mental block? Interpreting for “The President” is a big challenge while at the same time a truly great honor for us. Later, the organizers congratulated us for doing a swell yet tiring job of interpreting for the whole eight hours straight with only a few breaks. After that, we enjoyed the tour of the beautiful city of Sydney including a trip to Sydney Harbour and the Sydney Opera House. The city was truly amazing. And since we are already there, we were able to contact the Deaf Society of New South Wales and paid them a visit together with meeting with ASLIA officials. Although the experience was awesome, I observed some interpreting issues that I raised with ASLIA Representative Sheena Walters. One of the issue was if the deaf person is not looking at the interpreter, would you continue signing or not? But I will reserve that story on my next blog, including the observations I raised. Ma’am guided Davin Searls to visit the old building of MCCID College of Technology in Cubao. He is Executive Director of Discovering Deaf Worlds (DDW) and had interview with Sir Ervin. Ma’am Tina guided Davin to meet Mr. & Mrs. Esposa at the Registrar’s Office. Ma’am Beth volunteered to interpret the conversation between Mr. & Mrs. Esposa and Davin. Every time I had a chance to visit various countries here in Asia, I always see to it that I meet the local deaf people and their communities. Just last September, I attended the two-week Web Based Networking for Accessible Information and Communications Technology in Bangkok, Thailand. I was with deaf Edmond Guzman, my former student and now the trainor of MCCID’s newest branch in Quezon province. 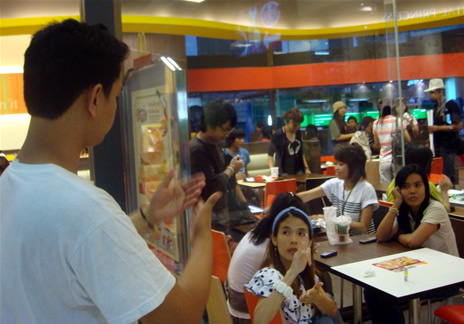 We were able to chance encounter young local deaf group chatting in signs at a McDonald’s restaurant. At first, it was difficult to introduce ourselves because of the sign language barrier. But when we got the hang of it, we let loose our signs. We were able to penetrate their conversations and understand their signs. All in but a few minutes of “getting to know” them. Middle finger of “P” hand circles above palm face down “S” fist then touches the center of the “S” hand. The reason behind this sign is that, we initialized the first letter of our name which is “P”. Then we circle it on “S” hand face down mimicking the sign of “ISLAND”. Our country is composed of 7,107 islands. The local deaf community incorporated that information into sign language. The logic behind this is that it outlines the shoulder cloth commonly seen Filipino National Costume of “Butterfly Gown”. This attire is always worn by our Former First Lady Imelda Marcos as her signature dress. American Sign Language signs our country name a little different. Instead of circling the “P” around the S fist, it just taps it twice. You may see the video of the sign here in MOV format. I promised myself, “I have to blog this place!” This splendid river is purely awesome! This is God’s wonderful creation in progress! When Sister Sarah Sta. Ana, the lovely hearing wife of Deaf Pastor Isagani Sta. Ana texted me inviting me to conduct sign language training in their province from August 19 to 22, I immediately said yes. I could not let this pass. She personally asked me to teach sign language to the faculty, staff, social workers and other special education teachers in Puerto Princesa City. She apologized for the abrupt invitation but she countered that their school in partnership with Christian Blind Mission, will sponsor all of my expenses including plane fare and hotel accommodation. However, she explained that I won’t receive any remuneration from the training. I said, it’s not a problem. But I requested that my deaf brother Ervin Reyes would accompany me while I pay for his plane ticket and tour expenses. That, we both agreed. On board Zest Airways, we arrived Puerto Princesa City airport after nearly an hour. There, we were happily greeted by Ma’am Sarah. At first glance, Puerto Princesa is a clean and orderly city. There are porters roaming outside the parking area taking their share of work in assisting travelers for a fee. But they are very cordial and organized. The airport is new and well-ventilated. You won’t feel threatened. The place is comfortable for tourists. There were unusually few taxicabs lining up. What caught our attention are tricycles that looked like mini-cars complete with two headlights protruding on its main nose. Its inside is uncrowded unlike some filthy and unkempt tricycles we have here in Manila. 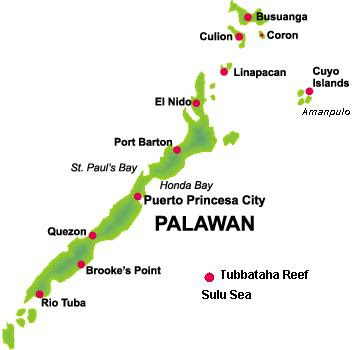 Palawan is a long island southwest of Manila. Considered as the last frontier of the Philippines, this majestic island is shaped like a folded umbrella. It is bordered by South China Sea on the east and Sulu Sea to its right. Puerto Princesa is its capital city. It’s now the largest city in the country in terms of its land area. It’s also very clean and orderly. You can see green-painted garbage cans in every few meters and it’s strictly prohibited to just throw your wastes anywhere. The place is also very secured. Ervin and I went outside of our hotel even at 2 o’clock in the morning without fear of being mugged. The following day, we headed to the world famous Puerto Princesa Subterranean River National Park. It’s some 80 kilometers on the other side of Puerto Princesa City even though it’s still part of greater Puerto Princesa. It’s located at St. Paul’s Bay connecting through the South China Sea. There were nine of us in a uniform tourist van including the tour guide. We were informed that the tour package fee is the same in every travel agency. This is in order to protect the tourist and give every tour owner a chance to make a living without going into bad business tactics. After nearly two hours of travel time, we have reached St. Paul’s Bay. Although it’s not part of our itinerary, the tour guide asked us if we want to add the Mangrove Park in our tour package. We simply add P150. All of us agreed. We weren’t let down. After a sumptuous meal of Filipino dish in buffet style, we all headed to where we came for, the famous Underground River. We first rode a mid-size motorized boat which brought us near the mouth of the cave. After nearly 30 minutes, we stepped on the sandy beach of St. Paul Bay. We then traversed a man-made pavement for nearly 10 minutes. Lo and behold, the main cave entrance was in front of us! The seven-man passenger alighted the small banca. Ervin sat in front and was given the chance to hold the battery-operated light and navigate the cave. Then, he got scared. So I volunteered to replace him and sat in front. Woooo! Scary!!!! The main man, the one paddling our tour, started his work. As he paddles us inside the cave, he tells us of many stories about the cave and what we expect when we go inside. As we go deep into the cave, everything is in pitch black. So I turned on our light. The place is so damp and cool yet dreary and eerie at the same time. The waters were so calm while the ceilings were so noisy with the chirping sounds of bats and what other beings that we can’t see. I know everybody is scared although we were too careful not to show it. A panicking passenger would turn our banca upside down. As we traverse the whole 1.4 kilometers of dark, damp and dreary place, the main man, was pointing into rock formations, stalactites (limestones that fall from the ceiling) and stalagmites (limestones that are collected at the floor). The highest ceiling was around 10 meters. We saw many familiar figures like a huge lizard, some popular vegetables like carrots, pechay and cabbage. We also find rock contours of a lady with long hair, the Nativity scene, Jesus Christ and Virgin Mary. You can see almost anything as far as your imagination can figure it out. The whole river stretch is around 8 kilometers. The end tip flows directly to the sea. We only traveled nearly 1 and a half kilometers because the rest of the river has a very small opening. Our boats cannot pass through those. But there are some tours that go as far as 4 kms. As we see a dim light shining in the horizon, we are getting more excited and relieved that we are nearing the end. I believe claustrophobic people must not go to this place. But for the rest of us, this is a challenge and a great place to be. I congratulate the sincere efforts of Mayor Edward Hagedorn and the local government unit of Puerto Princesa for successfully transforming this majestic place into a tourist haven. The pavement leading to the river was 90% cemented. The people were very cordial and helpful. The volunteers were really doing a swell job in protecting the diversity of the place. If I were you, I invite you to come and visit Palawan. It’s a great place to be! Aside from the river, there are other equally attractive places where you can go. There is the El Nido beach, the Honda Bay, dolphin and whale watching site and many more.